The hypoglossal nerve (cranial nerve XII) controls the muscles of the tongue. It controls tongue movements of speech, food manipulation, and swallowing. While the hypoglossal nerve controls the tongue’s involuntary activities of swallowing to clear the mouth of saliva, most of the functions it controls are voluntary, meaning that the execution of these activities requires conscious thought. Proper function of the hypoglossal nerve is important for executing tongue movements associated with speech. Many languages require specific uses of the nerve to create unique speech sounds, which may contribute to the difficulties some adults encounter when learning a new language. digastric muscle: A small muscle located under the jaw. hypoglossal nerve: The twelfth cranial nerve (XII) controls the muscles of the tongue. olivary body: Located on the anterior surface of the medulla, lateral to the pyramid. medullary pyramid: Paired white matter structures of the brainstem’s medulla oblongata that contain motor fibers of the corticospinal and corticobulbar tracts. The hypoglossal nerve is the twelfth cranial nerve (XII) and innervates all extrinsic and intrinsic muscles of the tongue, except for the palatoglossus. The hypoglossal nerve emerges from the medulla oblongata in the preolivary sulcus where it separates the olive (olivary body) and the pyramid (medullary pyramid). It goes on to traverse the hypoglossal canal and, upon emerging, it branches and merges with a branch from the anterior ramus of C1. It passes behind the vagus nerve and between the internal carotid artery and internal jugular vein which lies on the carotid sheath. After passing deep to the posterior belly of the digastric muscle it proceeds to the submandibular region to enter the tongue. 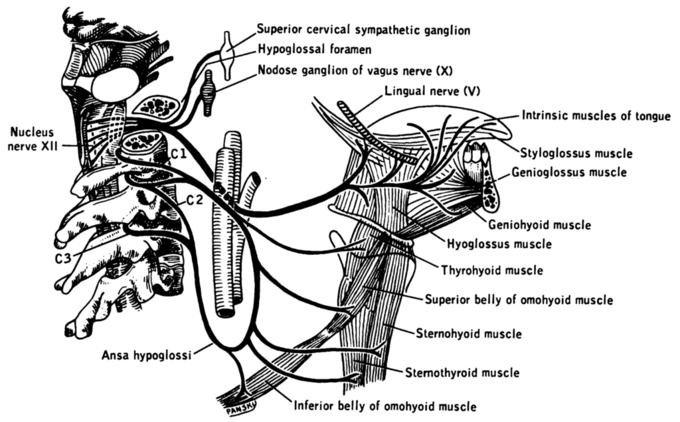 Hypoglossal nerve: Schematic image of the hypoglossal nerve and the structures it innervates. The hypoglossal nerve controls tongue movements of speech, food manipulation, and swallowing. It supplies motor fibers to all of the muscles of the tongue, with the exception of the palatoglossus muscle, which is innervated by the vagus nerve (cranial nerve X) or, according to some classifications, by fibers from the glossopharyngeal nerve (cranial nerve IX) that hitchhike within the vagus. Proper function of the hypoglossal nerve is important for executing the tongue movements associated with speech. Many languages require specific and sometimes unusual uses of the nerve to create unique speech sounds, which may contribute to the difficulties some adults encounter when learning a new language. Several corticonuclear-originating fibers supply innervation and aid in the unconscious movements required upon engaging in speech and articulation. Progressive bulbar palsy is a neuromuscular atrophy associated with the combined lesions of the hypoglossal nucleus and the nucleus ambiguous, upon atrophy of the motor nerves of the pons and medulla. This condition causes dysfunctional tongue movements that lead to speech and chewing impairments and swallowing difficulties. Tongue muscle atrophy may also occur.